Established in 1969 by the late Dave Jones, Silurian's original repertoire consisted mainly of Cotswold dances with a few Welsh Border dances for variety. 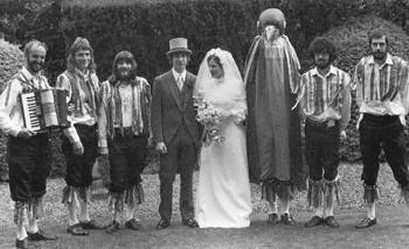 A number of people at this time, especially Dave Jones, were researching the Border tradition, and by 1979 Dave felt that there was sufficient material for the side to perform border dances exclusively. Up until that point Border dances had been performed on Boxing Day tours, dancers wearing their Cotswold Kit with blacked up faces. 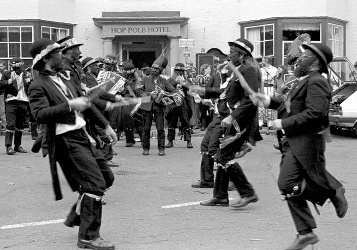 However, at the Bromyard festival that year, Silurian emerged in a new costume, based on descriptions on what the Upton Morris Men had worn at the turn of the twentieth century. The first Border Morris revival side, the new kit causing quite a stir amongst traditional Cotswold Morris Ring sides.In keeping with the tradition, the costume included black faces, shirts with tatters and tail coats, suitable for the traditional winter dancing. Many theories exist as to why Morris Men black their faces, but it is, quite simply, a disguise. Welsh Border dances are performed with some vigor to a fairly percussive accompaniment. Over the years, Silurian's band has evolved from a three-piece combination of accordion, flageolet, and tambourine, to what you hear on these pages: two melodeons, two accordions, fiddle, banjo, saxophone, sousaphone, bass and snare drum, plus the usual triangles and tambourines.